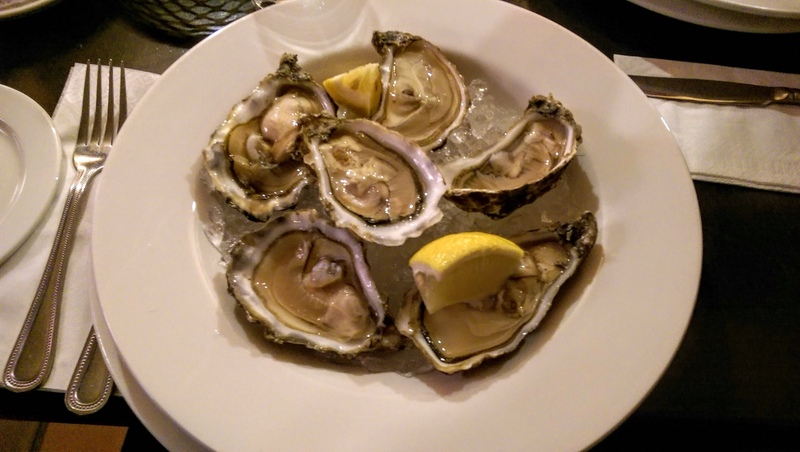 Monday evening during my short stay in Galway, I went out for a meal with a friend who lives in the town to Morans Oyster Cottage, a seafood restaurant in Kilcolgan, a short drive from the city. For the first course, we both treated ourselves to a “taster plate” of Native and Pacific oysters. They’d come fresh from the Clarenbridge oyster bed, a short distance away. Delicious! a hand written note of his poem, Oysters. A treat in more than one way! A few days after our short break in the Peak District I was down in Dartford with work. I’d travelled down by train via London so we decided to combine work with pleasure and the other half travelled down on the Friday morning and met me in London for a short stay. We were staying in a Premier Inn at Southwark near Borough Market. It’s a really “buzzing” area during the evening with plenty of places to eat and lots of pubs and bars, all of which were busy on an autumn evening. The terrorist attack by zealots who don’t like people having fun only a few weeks ago doesn’t seem to have stopped people getting out and enjoying themselves – and that’s the way it should be. The next day, after breakfast we went for a wander around the market. A plate of oysters. My starter during a meal at Donnelly's of Barna with my friend V, who first introduced me to Ireland and Ireland to me. Delicious! 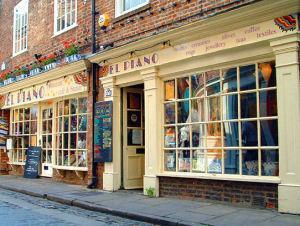 As a tourist honeypot, there’s plenty of places to eat in York. but during our recent visit we had some difficulty finding somewhere to eat for a quick midday meal. We wanted something more than a sandwich or ubiquitous Panini but didn’t want to sit down for a full blown 2 or 3 course meal in a restaurant. There were quite a few “teashops” and cafes serving not very exciting English style food, and all the usual chains like Cafe Rouge, Strada etc. They can be O.K. but we fancied something a bit different. Trudging round the streets of York for half an hour or so, it was getting a little late and I started to feel a hypo coming on so needed to find something quickly. Turning down a side street we came across El Piano in Grape Lane. I wasn’t sure whether it was a cafe or a shop at first, but there were some inviting odours wafting out of the front door, so we decided to go in and have a look. It turned out to be a cafe-restaurant and found a table in the corner next to the window so we could watch the world go by. The menu looked interesting, with largely Mediterranean style dishes, so we decided to order. We decided to have a selection of Tapas style dishes – one Spanish influenced and another Greek style. It was meat free, but that wasn’t a problem. We ordered some tea but when we were asked whether we wanted soya or coconut milk we discovered that it was not only vegetarian, but vegan, and so dairy free. We decided to have milk free green tea! The food was very good. A good selection of tasty dips and small plates with plenty of corn chips on the side. And it wasn’t expensive. The staff were very friendly and helpful too. Apparently the restaurant is part of a chain – with the other two branches in Spain. Eating out healthily in Memphis wasn’t easy. There were plenty of places serving good food, but in the main it was either fried or served up in a sweet sauce – not so great for a diabetic watching their diet! One place I particularly liked was the Flying Fish on Second Street, just opposite the Peabody Hotel. It was quite informal – a large chippie really, but much better than most you’ll find in Britain. It seemed to be very popular – it was always busy. They had an enormous menu and every time I went in there were people standing in the queue who were having trouble deciding what to eat. Most of the food on offer was fried, but there were some more healthy options. Chips (or “fries”) came as the standard accompaniment, but there was the option to substitute other vegetables, and I chose to have red beans and rice. There were both alcoholic and soft drinks available. I drank ice tea which was on tap and you could refill as many times as you wanted. The food came with dips – tomatoe salsa and mayonnaise – and there were bowls of crackers and various relishes on all the tables. Overall the food was excellent and extremely good value.